Liverpool’s Sandon Dock Wastewater Treatment Works, north of the city centre, was commissioned in 1991, and is the second largest in United Utilities’ (UU) portfolio. Dealing with 950 megalitres of effluent every day from a catchment of approximately 1 million people, it was no longer able to operate at full capacity due to ageing, and the outflow into the Mersey was not satisfying Environment Agency standards. United Utilities’ solution was to carry out a £50m refurbishment of the existing plant, and add a secondary treatment process to reach 100% effectiveness. But where could it go? The answer was next door, in the disused Wellington Dock. Built in 1848, and disused since the early 1980s, it was the perfect location for the £150m sequential batch reactor (SBR) that would provide the secondary treatment. But the dock was protected by English Heritage which meant that the SBR and its ancillary buildings had to be constructed independently of the dock structure. The dock had to be cleared of 30,000m3 of silt, sealed, then infilled with sand prior to piling operations. The sand was topped with a permanent piling mat, then 860 continuous flight augur piles, each 900mm in diameter, were sunk to an average depth of 15m to support the massive structure. The design and construct contract for the SBR facility was awarded to GCA, a joint venture between Galliford Try, Costain and Atkins, which was already a United Utilities alliance partner. 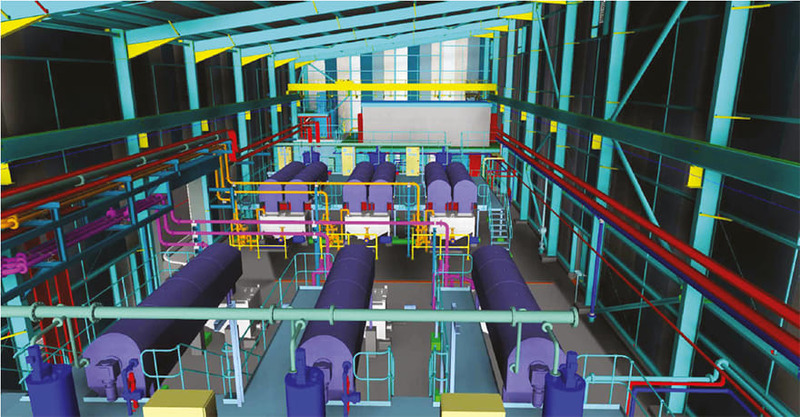 Because of the size and complexity of the project, with interfaces between civil, mechanical and electrical disciplines, as well as plant and equipment framework suppliers, GCA decided to employ BIM in the design process. The BIM strategy called for a 3D model to act as a “single point of truth” and the core of the design process, promoting a culture where the project team could explore alternative concepts, conduct value engineering, optimise designs, and plan and rehearse construction. This enabled collaboration and integration between the various parties in a more efficient way than ever before. Autodesk Navisworks was used to bring together more than 400 models of various formats to create the federated model for clash avoidance and 4D timelining. 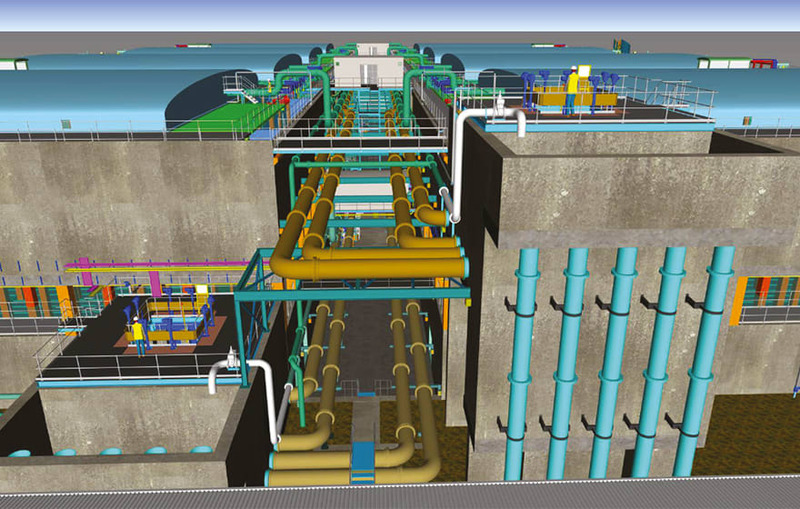 United Utilities created a 3D model in the concept and definition phases, which was used as a template for the detailed design. However, the CAD team, led by Matt Lees, Atkins’ BIM specialist, then decided to create a model from scratch. As the 3D design progressed, the design engineers were quick to see the advantages. “The engineers wanted to see what their designs looked like in the 3D environment and we were able to provide them with a virtual walkthrough of the model; this led to a more integrated way of working,” says Lees. But adopting a BIM strategy meant encouraging a leap of faith by the design and construction team, who were steeped in traditional workflows. Gaining acceptance of a 3D model as the core of the design process, rather than a “nice to have” visualisation, was the key to this, and once its value had been successfully demonstrated and accepted, the team embraced the BIM. The integration and collaboration it has promoted has resulted in much-improved coordination and a reduction in errors. By attaching piping and instrumentation diagram tags to assets such as pumps, valves and meters, the end user can navigate around the model, click on a tag, and receive operation and maintenance information. Autodesk Navisworks was used to bring together more than 400 models of various formats to create the federated model for clash avoidance and 4D timelining. A free version of Navisworks Freedom was made available to all design engineers, complete with a daily update of the model. The full site model is made up of more than 450 multidisciplinary, process and supply chain models. 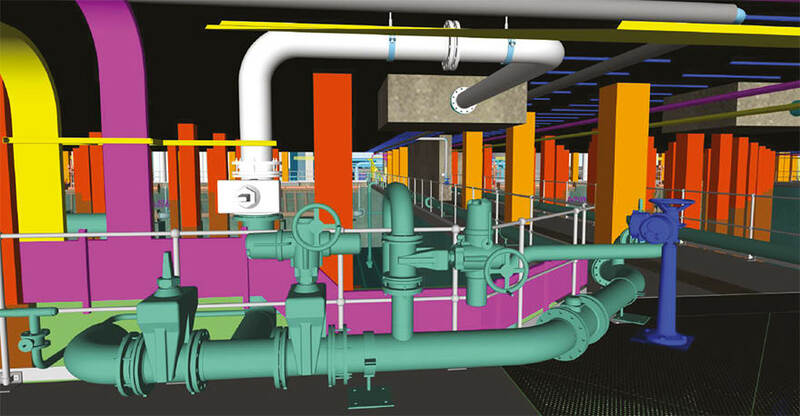 By utilising the Navisworks federated model, the CGA JV provided its supply chain with accurate, leaner and competitive tenders without the need for numerous 2D plans and sections, where subcontractors could also view their areas of concern in the full context of the project. As construction advanced, monitoring snags and health and safety issues became a more of a concern. But by employing Autodesk BIM 360 Field they could refer to the Navisworks model on handheld devices at the point of construction, allowing instant notification of issues to those responsible. The model has also provided the design team with an opportunity to demonstrate its possible use for the lifecycle management of the facility. By attaching P&ID (piping and instrumentation diagram) tags to modelled assets such as pumps, valves and meters, the end user could navigate around the model, click on a tag, and be presented with operation and maintenance information. Work on the treatment plant is still under way, and is expected to finish before the official deadline in August. Much of the success of the scheme can be attributed to a pretty brave decision on the part of CGA to go down the BIM route, and their success in carrying the client, their colleagues and their suppliers with them. The integeration and collaborative way of working using the BIM model is a step in the right direction. The model in my opinion will also cut a lot of waste in the construction process and detailed information emanating from the model is good news for the construction team.